​Crystal Palace welcome fourth place Chelsea to Selhurst Park in a Premier League London derby on Sunday. The Eagles, buoyed by their recent scalp over Manchester City, failed to follow up their impressive win as they were held to a goalless draw by lowly Cardiff on Boxing Day. Meanwhile, Maurizio Sarri's side bounced back from a home defeat to Leicester by holding off Watford at Vicarage Road for a 12th win of the season. Both sides will look to end 2018 on a high as they seek improved second half campaigns in the Premier League. Here's 90min's breakdown of ​Sunday's clash. ​Crystal Palace manager Roy Hodgson has been boosted by the recent return of long term absentee Connor Wickham, who made only his second appearance of the season in their draw with ​Cardiff. Fellow forward ​​Christian Benteke could soon return to action having been out since early September after undergoing knee surgery, whilst goalkeeper Wayne Hennessey is pushing to reclaim his starting spot having missed the last three fixtures. Chelsea have been handed a double blow with forward duo ​Pedro and Callum Hudson-Odoi ruled out after picking up injuries last time out. The Spaniard suffered a hamstring injury and was replaced by his counterpart - who likewise suffered a similar fate and was unable to see out the match. Crystal Palace​ Guaita; Wan-Bissaka, Tomkins, Sakho, Van Aanholt; McArthur, Milivojevic, Kouyate, Meyer; Townsend, Zaha. ​Chelsea ​Kepa; Azpilicueta, Rudiger, Luiz, Alonso; Kante, Jorginho, Kovacic, Willian, Hazard, Giroud. In 53 games in all competitions between the sides, Chelsea have the upper hand with 26 victories compared to Palace's 12 - with 15 ending in stalemate. The Blues won the reverse fixture in ​November at Stamford Bridge - as ​​Alvaro Morata grabbed a brace on the way to a 3-1 victory. Unbeaten in their last three league games, Hodgson's side have given themselves welcome breathing space above the bottom three. Sitting 14th, the Eagles have shown they're capable of upsetting the big guns in the division - notably a 3-2 ​win at City. Dominant displays over ​Burnley and notably Cardiff also raised some eyebrows - albeit gaining four points instead of all six over the two games. 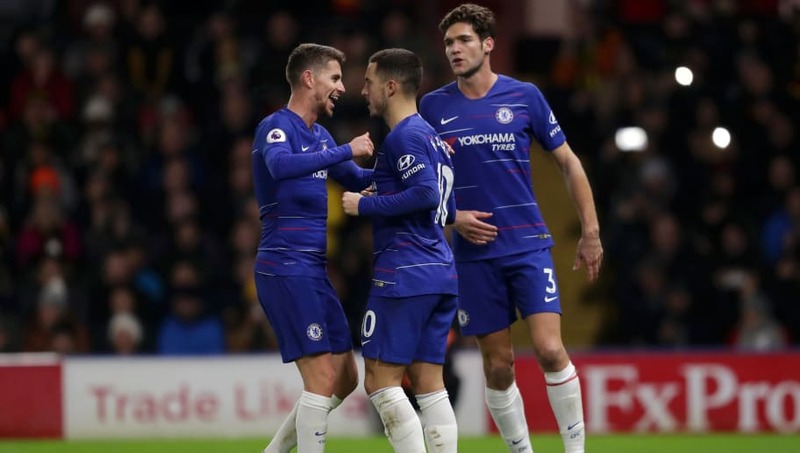 On the contrary, Chelsea have demonstrated a few weaknesses in recent weeks - succumbing to surprise losses against Wolves and recently Leicester. However, the continued form of irreplaceable star man ​Eden Hazard has been vital to their thin chances of a title challenge. The Belgium international has been directly involved in 19 goals this season - registering ten goals and nine assists, whilst achieving an unprecedented landmark by becoming only the tenth Chelsea player in their history to reach ​100 top flight goals. Palace's impressive form at home has been rewarded with three consecutive clean sheets, but face arguably the division's most lethal forward in Hazard. Third in the Premier League goalscoring charts, Chelsea's chances of snatching all three points on Sunday almost solely rely on Hazard's contribution to the cause. Nevertheless, it should be an intriguing clash and with the likes of the Hazard and ​Wilfried Zaha going toe-to-toe, expect goals.